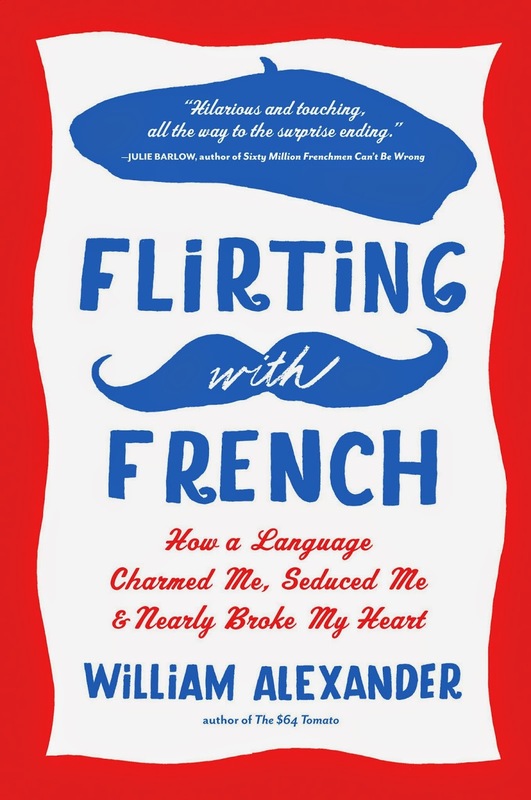 I just finished William Alexander's wonderful Flirting with French: How a Language Charmed Me, Seduced Me, and Nearly Broke My Heart, and I highly recommend it to anyone with any interest at all in learning another language. In his thirteen-month quest to learn French, the 57-year-old author tries everything short of marrying a French woman, and he describes it all in hilarious detail. It's a story about a language, it's a story about people, and it's a story about not giving up. I bought this book after reading an excellent New York Times review. Building on that, I'm going to go through the various things Alexander tried and comment on how effective I think they are for others trying to learn French. Since I taught myself French during the past nine months using many of the same materials and yet pretty much the opposite philosophy, I'm in a good position to compare and contrast. Given the nature of his book, I don't think it's possible to have "spoilers," but it's possible some people might want to read the rest of this post after finishing the book. What did he know to start with? Alexander had studied French for two years in high school, and even though that was 40 years ago, it still seems to have given him a head start. He took an online college placement exam which said that he almost qualified for "entrance into first-year college French." Since the qualifications for entrance into first-year college French are tuition and a pulse, I assume he really means he almost qualified for placement out of the first semester. That's not bad at all. Unfortunately, he hated his high-school French teacher and as a result had nothing but contempt for the whole concept of learning a language in a classroom. He intended to teach himself using the latest technologies, but without a teacher or even a tutor. For my part, I had never studied French before at all, but because I speak Spanish and Italian, I had something of a head start of my own. Why did he want to learn French? Motivation matters, and his motivation was that he loved France and and all things French so much that he wanted to be French. Obviously that meant learning to speak the language and not just read it; he wanted to attain conversational fluency in French. My own goal for learning French was to be able to read books in it, and as a side-effect, to prove out my ideas that devices like an Amazon Kindle can make it much easier to read books in foreign languages. In thirteen months, Alexander put 900 hours into active study, he spent "hundreds" of hours passively absorbing French movies, TV, and radio, he practiced with French people locally and online, and he spent at least five weeks in France. I estimate he spent at least $20,000 in the process. If nothing else, one has to salute the power of his motivation. For my part, I invested about 500 hours in active study. I also practiced with French people locally and online, and I spent about $100. Using the levels from Common European Framework of Reference for Languages, I'd have expected that much investment to make him a strong B2 speaker, verging on C1 in some areas. Instead, he seems to have barely managed to reach B1. You can do a lot with B1 French, but given that given that he dreamed of being a C2 speaker, he missed the mark by a long shot. I estimate that I'm also speaking B1 French, but I'm reading at between a B2 and a C1 level. Since we had very different goals, we took very different approaches. He shunned formal training, books of rules, tables of verbs, etc. Obviously those are things you cannot use in conversation; everything must come to you naturally. He was drawn to approaches with little or no written component, and definitely to those with no English component. I bought grammar textbooks (my only actual expense), drilled vocabulary with flashcards, and used a free online program called Duolingo, which essentially trains you to translate from French into English. I used some of the other resources Alexander did, but only as a supplement to my main program. I do want to speak French (not just read it) but that's not my top priority. Given, then, that we had very different goals, it's comparing apples to oranges, except for one thing: I think he picked the wrong goal in the first place. My opinion is that if you build up strength in reading and writing, you can leverage that to improve your ability to converse and to listen. Learning to read a language is not sufficient by itself to make you conversant--there are many, many people who can read English and even send e-mails but who can't utter a comprehensible sentence--but I think it's a necessary first step. This is backwards from how children learn, but adults are not children and do not learn the same way. I should note that my view on this is rather old-fashioned, and a great many people don't agree with it. Alexander certainly didn't. Draw your own conclusions. In this section, I'm going to go through all the resources Alexander writes about using, in the order that he mentions them. I'll summarize his results and then give my own opinions. What draws him to Rosetta Stone is the promise of teaching you the language "like children learn"--i.e. not with the methods of his hated high school teacher. Instead, it tries to immerse you entirely in French--spoken French--and get you to learn by osmosis. Alexander's hilarious account of what it's like to actually use Rosetta Stone is in the chapter titled "First-Person Shooter." It's priceless. He never comes out and says so, but it appears that he got very little of value for all the hours he spent with it. I am amazed that he had the determination to complete Rosetta Stone. Studies I've read suggest that almost no one does so. I won't go into depth on the problems with the package, as others have done so at great length. Since it's so far away from my own philosophy of language learning, I never even considered it, so I have nothing to contribute first-hand. A two-week bike vacation in France may not seem like a language-learning technique, but according to some research, a pending trip to a foreign country motivates people to do language study more than almost anything else, so as a technique, it's not to be underestimated. In terms of price, it certainly makes Rosetta Stone look cheap. That said, it's not clear how much you really learn on a vacation. You read signs and talk to waiters, mostly. A business trip where he'd have had to use the language all day long would have likely been much more effective. I didn't visit France this year, although I have been there before, but all this French study has definitely given me a powerful desire to go back! He spent an hour a day watching this famous international French cable network, but apparently never discovered that you can get it online. The free online version has an excellent set of lessons, which are targeted at making it easier for students to learn how to watch their shows, but he either didn't discover them or else decided not to use them. Since he speaks about "enduring" the shows, I gather he didn't get a lot out of them. No surprise. Nation claims that you need to know about 6,000 word families before you can watch a movie, and that's two or three times what someone knows after two years of college study. I made extensive use of the lessons on TV5Monde, even though they are really targeted at listening comprehension, because I didn't want to develop bad pronunciation habits. Their lessons are graded, and I advanced from A1 to B1 over the months. That means I can watch a French news broadcast and pick out a lot of it, but movies are still hopeless. Breaking a bit from his idea that he would learn French entirely through osmosis, he signed up for an online class complete with video and a live instructor in France. He appears to have done only a single lesson this because they expected such a high level from their students that English wasn't allowed even to ask for the definition of a word. This is something I've never even considered doing. It's something that might make sense to try next year--once my reading is better. It does bring up another point; once you are strong enough in a language, you really can study it without using English. That is, people can teach you French in French. However, I think you need to reach level B1 before you do that. In my opinion, Alexander did this in the wrong order. He only mentions this $500 product briefly to share the fact that he didn't like it, although he later tells us he completed the whole thing. Fluenz is quite different from Rosetta Stone: It uses English in the lessons to explain some of the grammar, although it stops short of giving detailed rules for things like verb conjugations. Alexander's complaints were more to the effect that he wanted more focus on speaking and that he found the videos distracting. It does seem that Fluenz should have been an improvement on Rosetta Stone, but apparently not much of one. I hadn't heard of Fluenz before, so I searched the web for "Fluenz Problems." Apparently Fluenz only tries to bring people up to about the A2 level. Great for a traveler--A2 French is enough to get a lot done and it'll impress your friends and family--but it's not what Alexander was seeking. I only mention this because it's something a lot of people talk about doing. Alexander and his daughter used sticky notes to label everything in the house in French. He only mentions it once, so I have no idea whether it worked for him. I have a suspicion that his wife didn't put up with it for very long. I have never done this myself, but I can see the merit in it. Household vocabulary is important for reading, since many scenes in novels take place inside houses. You can also practice the language by making up sentences that use the words as you bump into them. The biggest limit is that it only covers a faction of the words you need--and none of the verbs or adjectives. Frustrated with Rosetta Stone and Fluenz, Alexander decided to give social networking a try, and he enrolled in MyLanguageExchange. Oddly for a man so focused on speaking, he opted to use MyLanguageExchange strictly for e-mail correspondence with a pen-pal named Sylvie who lives in Orléans, France. He used Google Translate, WordReference, and a printed dictionary to help compose messages, and he maintained a correspondence with Sylvie for months. When he finally met her in person, she was appalled at how bad his spoken French was, considering that his e-mails had been so well written. Alexander doesn't make a big deal out of it, but this is actually his one big success with French; he clearly developed decent reading and writing skills, even though that was not his goal. There's a lot to be said for using social networking to help people learn languages. It lets you practice reading, writing, listening, and speaking with real native speakers. I practice writing using Lang-8, which is a bit more limited than MyLanguageExchange, but follows a similar principle. For example, I can write something in French, submit it, and get critiques from native French speakers. In return, I critique their attempts to write English. It's a great way to learn. Alexander used Meetup.com to find a local group of French speakers who meet regularly for practice. He describes it as like attending a meeting of Alcoholics Anonymous, with twelve people sitting in a circle taking turns talking. Worse, his group had only a single native speaker. It's not clear whether he attended more than once. It's a pity this didn't work out for him, because I've found Meetup.com an excellent way to practice conversation. Here in Seattle, there are French, Spanish, and Italian groups with a mix of learners and native speakers. There are weekly meetups, and when I go, I force myself to speak only my target language for two hours. If the goal is to be conversational, this is the best way to get there. A memory palace is the trick Sherlock Holmes used to quickly memorize lists of things. You visualize the words you're trying to memorize as lying in some physical location you're familiar with. Alexander says he successfully used it to memorize the entire 1,000-word children's English-French dictionary with 98.5% recall. Since the largest barrier to conversation for most intermediate students is lack of vocabulary, I really would have expected this to make more of a difference that it appears to have. Perhaps the memory palace is just too slow to use in conversation, but I would expect it helped him a lot with his reading and writing. I've personally never managed to make the memory palace trick work, and I'm not sure it's really the best idea for anything other than lists that you need to recite in order. He watched at least one movie: Les herbes folles (Wild Grass). Since his wife watched it with him, it must have had English subtitles. I personally find it impossible to hear much of the foreign language in a film if I'm also reading the English subtitles. Subtitles in the foreign language work much better, but are harder to find. As I mentioned earlier, it takes a very big vocabulary to enjoy most foreign-language films. My bet is that he understood only a handful of words. Reading is my favorite way to learn. Alexander casually mentions reading "the Respectful Prostitute" by Jean-Paul Sartre with the help of a dictionary and a translation. The "and a translation" is what worries me. It's very easy to half-guess at a paragraph, read the English, tell yourself "oh yeah, I got that," and keep going. You finish the book and imagine that you really read it. The same concerns apply to the dual-language book he read. Depending on how he read it, it might have helped his reading ability a lot, or it might have done little or nothing for him. A disciplined person can make this work--someone who makes a detailed study of sentences they didn't get on the first try--but you have to really push yourself to do that. If you're enjoying the story and want to get on with it, it's hard to make yourself stop. If you're not enjoying the story, it's hard to do this at all. I have my own ideas for learning a language by reading, and I feel I've been very successful with that approach. Given Alexander's success with his pen pal, I suspect he was more successful than he lets on. On Skype, Alexander found a 50-year-old woman who wanted to practice her English in exchange for helping him with his French. Unfortunately, her English was so much better than his French that she couldn't even be bothered to try to correct his mistakes. This sounds like another one-time experiment, and, if so, I think it's another missed opportunity. Real-time conversations on Skype had the potential to make a really big difference to his conversation ability, especially since he had no luck with a local Meetup group. Because meetup.com works so well for me, I haven't bothered with Skype, although I've thought of doing it to get exposure to more kinds of accents. Eventually he broke down and decided to take an actual class. Run by the New School in New York City, this was a one-time, 16-hour immersion class with only four students (him included). The instructor wasn't a native, but that didn't seem to bother him. In this class, he learned that he wasn't distinguishing nasal vowels at all. No wonder people couldn't understand him! I'm surprised he didn't find a way to get some sort of intensive training just in pronunciation. French vowels have been, for me, the hardest part of learning French. French has lots of vowels that English doesn't have, but making the vowel sounds is only half the problem. English is rather sloppy with its vowels, and we tend to slur them all in the direction of "uh" in unstressed syllables. To speak French, you must fight this habit and pronounce each syllable clearly and distinctly. It's like fighting with your own tongue. Finally, he invested about $5,000 in a top-notch, two-week intensive-study program in France. This included room and board, 30 hours a week of classes (no more than four to a class), after-dinner talks, and group discussion. His description of his interactions with people during this period makes it seem as though he were actually speaking French at the B2 level or better. Given the level of individual attention that Millefeuille offers, I would have expected them to really work on his accent. He certainly finished up feeling really good about his French. I did something like this for Russian back in 1992, when I spent six weeks in St. Petersburg. I do think two weeks is too little time, but I also think it was good that he did this last, since it would have been wasted had he tried it before he had a reasonable grasp of the language. Remember the French pen-pal? After all this, fresh from boot camp, he met Sylvie and her fiance in Orléans for the very first time. It was a disaster. He couldn't understand their French, and they couldn't understand his, so they ended up speaking English. This is why I evaluate his conversational French as B1. A B1 speaker can manage a conversation with people who are willing to indulge him, but the way he describes the afternoon, they weren't in the mood. A B2 speaker should have been able to manage it, even if it was a struggle. You'll have to read the book to learn why Alexander needed to bribe a taxi driver, but he managed to argue with the guy and get what he wanted all in French. For me this reinforces the B1 rating, since an A2 speaker would be unable to cope with a non-routine setting. At least, I hope it's not routine. Coffee Break French. These are podcasts, of which he listened to 100. It looks interesting, but I know nothing about it. Pimsleur Audio Courses (2). I used Pinsleur Mandarin before a trip to China. It's an all-audio course, with no textbook. For my purposes it worked quite well--when I got separated from our group I was able to tell a Taxi driver how to take me back to our hotel. Pimsleur is generally thought of as a very elementary package, though, targeted at travellers. French In Action (all 52 episodes). I like FIA. I haven't finished it, but it's fun, it's free, and it's 100% in French. It's an attempt to teach French in French, although there's a textbook that you can buy. As a supplement, I think it's a great way to get used to hearing French people speaking naturally but using few enough words that you have a hope of understanding them. "Classes are a sore point for me," he tells us, owing to that bad teacher he had in high school. He claims he couldn't find any nightly classes in his area and dismisses the idea of once-a-week classes out of hand--even though his wife claims to have learned Spanish that way. I didn't use classes for French either, but I'm a linguist with an interest in second-language learning and I already spoke five other foreign languages. I think a good class (or at least a proper textbook) would have helped him a lot. Alexander never mentions Duolingo at all. It might have had too much typing for his taste, or perhaps he thought it was too similar to Fluenz. It's also possible that he did most of his studies before Duolingo really took off. I personally like Duolingo a lot, as I've described elsewhere. Duolingo is not a panacea, but I have to think that had he put hundreds of hours into Duolingo instead of Rosetta Stone, he'd have been better off. Richer too: Duolingo is free. Perhaps he felt his memory palace eliminated the need for flashcards, but I think flashcards are the secret to learning lots of vocabulary, and I think Anki is the best flashcard program out there. The closest he comes to flashcards is his post-it notes experiment, and that's doing most of the work without gaining much of the benefit, in my view. Failing all else, I think flashcards would have been a good way to manage and maintain his memory palace, but he never mentions the concept at all. Given that his focus was speaking, it's not a surprise that he doesn't mention this site where users help each other improve their writing ability. However, since it appears reading and writing are the two abilities he really did develop, it's the sort of site he ought to be looking at now. He seemed to have a strength there--perhaps not a surprise, since he's a writer. He should build on it. Alexander's goals were different from mine. For me, reading is #1 and everything else is a distant second. For him, conversation was #1. Conversation practice is difficult to arrange, and the various programs that promise to "immerse" you really don't seem to deliver. Reading practice, especially using a Kindle, is easier than it has ever been. So I set myself a much easier task than he did. Even so, he didn't really fail. B1 French is nothing to sneeze at, and, as I said elsewhere, I suspect he reached B2 or better in reading and writing. It's only that he set his sights so high and worked so hard that it seems like failure. I do think he'd have gotten better results if he'd used his time differently. In particular, if the backbone of his study program had been a more traditional weekly class of some kind, then he could have augmented it with some of those other resources he used. If he had recognized that the written language came easier to him, and if he'd trusted that progress in that area would eventually help him with conversation, I think he wouldn't have wasted so much time bashing his head against the wall. Of course, that would have taken a lot of the fun out of the book! I may not have learned all the French I wanted to, but what I did learn has enriched my life immeasurably. Yet perhaps the most important French lesson learned over the past year is this: you can love a thing without possessing it. Even as French has eluded me, my ardor for the language has only grown. I love, and will always love, French. Whether it loves me back, I have no control over. Apparently U3A never caught on in the US. It probably sounded too much like "new age." Enjoyed your review, I plan on reading this book.